In late September, crowds dressed in kimono, happi coats and eisa outfits gather at the Hawaii Okinawa Center. Young and old, newbies and pros, dance to the beat of taiko, sway to the sounds of sanshin and cheer, "iya sassa-ha iyaa!" into the night. Traditional Okianwan numbers are combined with time honored and contemporary Japanese favorites for an evening of culture, food and fellowship. Along with great music and dancing, matsuri goers can enjoy onolicious andagi and other local favorites. 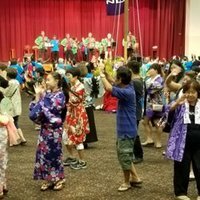 Each year, the Matsuri is coordinated by the efforts of many volunteers. Ippee nifee deebiru, mahalo and thank you to their hard work and support! Saturday 9/15 - 5:00-9:00 p.m.
daniyang8 . Last modified Jul 12 2018 1:04 p.m.